In the tradition of Sorolla, Sargent and Prendergast we will be painting　the en plein air in Cortona, Italy. Simple scenes from everyday　life are a long-standing tradition of the plein air painter. Picture yourself standing under the sun in Tuscany painting with a local model　posed before a vineyard or within an olive grove. Other painting sessions will be in and around town where scenes of people going about their daily business abound. A day trip is planned for Florence and the Uffizi Gallery, with emphasis on viewing paintings with the figure in the landscape. Another day will be spent in Orvieto painting its residents and guests. *Beginning painters are welcome! More experienced artist are invited to work in the medium they feel most comfortable using. The instructor primarily works in acrylic but is also comfortable working in pastel, watercolor and acrylics. Students will learn to work quickly and get the gesture of a figure down on the canvas in order to go home with paintings that could be developed into larger, more finished pieces. Kathy will demo and work in Acrylics, but all mediums are welcome! What to expect: First and foremost--Have fun!! Our goal will be to paint a vision of life in Italy with people going about their daily business while capturing the ambiance of the lovely town of Cortona. Don't expect to go home with finished masterpieces--if you do, lucky you but plein air painting, by its very nature, is never really a completed painting. It is a moment captured in time, the essence of the locale. You should be able to go home with pieces that you can work into larger, more complete paintings. Please don't forget to bring your camera with extra batteries, charger if needed, memory cards. *If you have a charger for your batteries, please remember to bring voltage converters and plug adapters, if needed. -Day trip to Orvieto with demonstration, workshops & lunch included. Brushes: a good assortment of sizes. PLEASE no �craft� type brushes or soft bristles. Long handled with coarse bristles in flats, rounds, filberts. Palette knife for scraping and mixing. Acrylic mediums: extender�retards drying time. Squirt bottle for misting palette. Surfaces: Canvas boards, gessoed masonite or gessoed watercolor paper with a support and clips. Board carrier--there are several companies that make carriers of different materials and quality. Easel: Open Box M or whatever works for you. Palette--I use a Masterson Stay-wet palette with a lid and a paper palette pad and sponge inside. Paints: for painting with a limited palette, I have found specific colors and brands to purchase. If you veer off the list you will not get the same results. Sketch book and pencils or Pigma pens in varying sizes. If you are the veteran plein air artist and have a favorite medium, then bring the supplies you would normally use unless you prefer to give acrylic painting a try and you may follow the supply list above. painting among the sights and sounds of beautiful Santorini: Crystal blue water, vineyards, centuries-old buildings, narrow winding streets, bold color and vibrant sunlight. in the warm ambiance of Santorini, overlooking an ancient volcanic caldera, claimed site of the lost city of Atlantis, originally fortified by the Minoans, claimed by the Romans, touched by the Venicians, almost unchanged for centuries, one of Greece's jewels. the joy of learning and gaining painting skills and confidence the expert instruction of an acclaimed professional painter and the camaraderie of a small group of learners. great Mediterranean food, delightful wines, new friends, breath-taking vistas, history and the hospitality of the people of Santorini. *Air travel is not included and is the responsibility of each participant. Santorini is served by Aegean and Olympic airlines from Athens. During the week we will visit the towns and villages of Fira, Oia (pronounced Eee-ah) and Akrotiri, and the local museum featuring wall paintngs from the ancient city of Akrotiri. We will also take a day cruise to explore the inner islands, with optional visits to hot springs, the volcano, as well as the island of Thirasia. And, in true Toscana Americana Workshops style, we will explore the local Greek culture, cuisine and wines while dining in local cliff-side restaurants 1000 feet above the water! 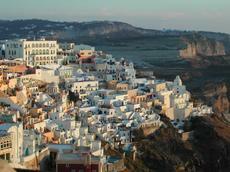 Santorini is one of the cycladic islands, created by the eruption of the volcano 1500 B.C. (thought by some to have brought about the end of the Minoan civilization and speculated by some as the famous island of Atlantis). Due to this, the island offers a versatile landscape with on the one hand steep darkish rock formations and on the other hand beaches and small white villages. Besides that, there are several interesting monuments and the active volcano of course. Thira offers, besides remnants from several eras, ruins of the old Roman baths, theatres and markets. Santorini is a group of islands in a circle about 10 KM across - the rim of a large volcano that is still producing small islands in the center. Steep slopes lead to the central area and gentle slopes lead to the sea that circles the island. It's really a group of islands even though it is usually discussed as if it were one. Settlements are scattered around the island as a series of small villages. The famous white buildings are huddled close to one another on and over the cliff of the central caldera. Hiking paths and trails lead all over the island, but a charming time can be had walking the paths that interconnect the settlements and exploring the shops. Visitors can take ferry boats to the central island(s) to visit the new land and soak in hot springs. -6:30p Welcome to Santorini wine & chocolate tasting at Zafora. For Acrylic painters, please see the list above. 1 large bristle brush about a size 10 or 12 for scumbling or toning the support you paint on--please don't get an expensive brush for this one as it will be used roughly. We will be using Liquin to help dry your paintings before you leave Italy. Pack in your checked luggage. Surfaces: Canvas board--with Masonite support not cardboard as the cardboard will warp. You may also use gessoed Masonite. Please pack plenty of boards as we will focus on working quickly. I figure on a minimum of 2 pieces per day but you may want to think about bringing a few extra boards just in case. Please do not bring stretched canvas--you will find that the sunlight goes right through them making it difficult, at best, to work and it will take up a lot more room in your bags. Do not go larger than 11x14 or smaller than 8x10. Board carrier--there are several companies that make carriers of different materials and quality. I have one is corrugated plastic and one made of wood. The plastic one is light but doesn't hold much, the wood one is heavier but holds plenty. Brush Cleaner and Restorer--I use "Old Masters" and find it very good for lifting paint out of my clothes too. You can buy this in small cakes or in a tub--for travel, I recommend the cakes. Stainless steel brush washer. Empty! You are not permitted to carry turps on an airline--I clean mine out and leave the lid off in the suitcase. Yours should have a rubber gasket inside the lid, a handle to hang off your easel and latches to lock it. Anderson and Sons is one brand--it should have a strainer at the bottom to filter out paint residue. It need not be huge--it should hold about a cup of turp. Easel--currently I use a simple field easel--wood tripod that hold 2 supports at once--Madison Art shop online has a similar one-- with Irwin quick-grip clamps clipped on to rest my palette box on top of. In the past I used a French half box but found it didn't hold up well and frankly got too heavy at the end of the day. Palette--I use a Masterson palette with a lid and a paper palette pad inside. At the end of a session, I can put that lid on and keep the paints usable if kept in a cool place until my next painting session. When I'm done, I can toss the paper. You may prefer to use a reusable palette instead but I do recommend the Masterson to hold it and keep your paint fresh longer. Paints: Please, do not buy student grade paints. The pigment suspension is not as great as in professional grade paints and you will become frustrated quite quickly. Also, do not get any paints that say "hue" on their label this is not a full color. *All cadmium colors are expensive (cobalt too), you will not likely need a large tube for the week plus you need to be prepared to carry things so only get a large tube of white. Optional: Sketch book and pencils or Pigma pens in varying sizes. A tote to carry your supplies--a simple backpack will do and you can also get them with wheels that works quite well. I bungee cord my palette box to my totes. I also live by the camper's thought of "If you need it, bring it. If you carry it in, be prepared to carry it out." There are many supplies available to the plein air artist, please don't feel the need to buy everything until you decide exactly what feels comfortable and manageable to you. Wear comfortable shoes--the best you can afford as you will be on your feet a lot. Wear comfortable clothing that you won't mind getting paint on--besides, it's a badge of honor to see paint on your clothes, everyone will know you're an artist. Bring a hat, sunscreen, water bottle, any medications you need, and bug repellent (lotion is preferable since the spray wanders). If you are the veteran plein air artist and have a favorite medium, then bring the supplies you would normally use unless you prefer to give oil painting a try and you may follow the supply list above.